Rochester Institute of Technology is being recognized by The Princeton Review for being one of the nation’s best colleges for students seeking a superb education with great career preparation and at an affordable price. The education-services company features RIT in the just-published 2016 edition of its book Colleges That Pay You Back: The 200 Schools That Give You the Best Bang for Your Tuition Buck. The Princeton Review chose the schools based on return on investment ratings it tallied for 650 schools last year. The ratings weighted 40 data points covering academics, cost, financial aid, graduation rates, student debt, and alumni salaries and job satisfaction. The Princeton Review editors culled data from the company’s surveys of administrators and students in 2014–2015 and from PayScale.com’s surveys of school alumni conducted through April 2015. According to the publication, academic ratings were calculated using factors including how many hours students study outside of the classroom and the quality of students the school attracts. Also considered were students’ assessments of their professors, class size, student–teacher ratio, use of teaching assistants, amount of class discussion, registration and resources. RIT’s financial aid rating was calculated based on school-reported data on the percentage of students who were determined to have need and received aid, the percentage of need met for those students, and the percentage of students whose need was fully met. Student survey data that measures students’ satisfaction with the financial aid they receive is also considered. According to the report, around 77 percent of undergraduates receive merit- or need-based financial aid, with first-year students receiving an average gift-based award of $18,500. The publication also cites that RIT’s Office of Career Services and Cooperative Education helps arrange for counseling, mentors, job prep, portfolio reviews and career fairs, “keeping the hire rate straight out of college well above 90 percent.” According to the latest information on the class of 2015, the average annual starting salary for bachelor’s level graduates is in excess of $61,000. The Princeton Review is an education-services company known for its test-prep courses, tutoring, books and other student resources. 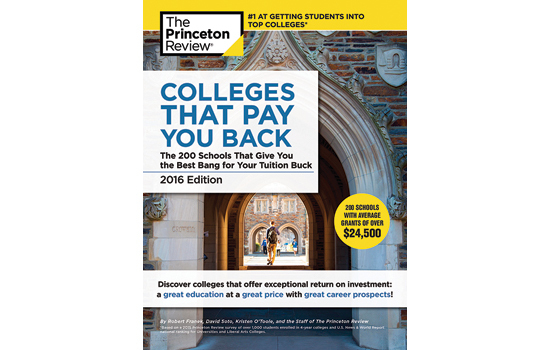 School profiles in Colleges That Pay You Back are available at www.princetonreview.com/colleges-pay-you-back.